This dish was prompted by our opening a bottle of Bordeaux. Although the label said it got a “Gold Medal” in Paris, this one did not even reach our Wednesday night wine quality guideline (which is the lowest we will go). It sat on the kitchen counter for a few days. I thought about making the ususal stews with this wine but I somehow remembered seeing the recipe for red wine marinated tofu. I could not find the recipe but I decide to just wing it as I often do. 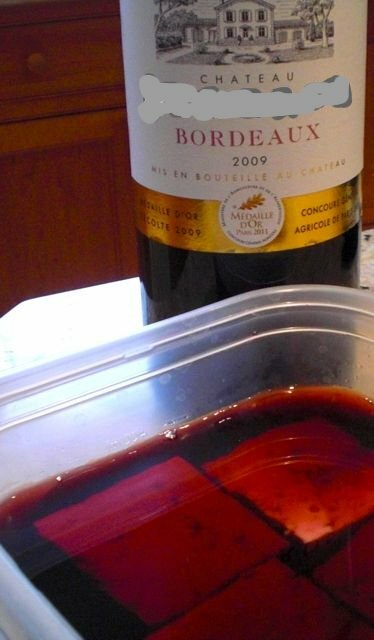 Marinade: Here is the bottle of Bordeaux (the identity was concealed to prevent any negative percussions from Francophil wine drinkers) which I used. Tofu: I just cut a half of silken tofu into four cubes. I poured the wine into a sealable container and marinated it overnight in the refrigerator. I did not add anything else. I was quite impressed with the looks of this tofu dish when it came out of the marinade! It attained a beautifully stunning Burgundy (or Bordeaux in this case) color. So, the next question I faced was how to garnish and season this tofu. I decided to go with a bit of a Western twist while keeping Japanese seasoning. Toppings: I finely chopped green picholine olives (to keep with the French theme, 5-6 finely chopped), black walnuts* (2 tsp, roasted and finely chopped), and chives (2 tsp, finely chopped). *My wife baked bread earlier in the day and this happened to be leftover from that. I placed the tofu on a bed of baby arugula sprinkled with a dressing of soy sauce and olive oil. I also added wasabi and soy sauce on the side. Despite the stunning color, the red wine did not penetrate much deeper than the surface of the tofu and did not impart a strong flavor (which may be a factor of its less than sterling basic quality). Nonetheless, there was something I could not quite put my finger on–a “je ne sais quoi” quality to this tofu. Savoring this subtle flavor as well as the enhancements from the salty olives and crunch of the walnuts, we added soy sauce and wasabi and cleaned the plate. (There is something quite intriguing about the crunch and taste of walnuts with tofu which is worth trying in other venues). I will make this dish at least once again with more variations in the seasonings and toppings next time we have a wine which does not pass our minimal criteria for drinkability.